Yet again a random click leads down an internet rabbit tunnel. Or a dead end. I meant to do another blog post, and was rummaging through the public domain images the Library of Congress Free to Use Extension puts in my new Chrome tabs. 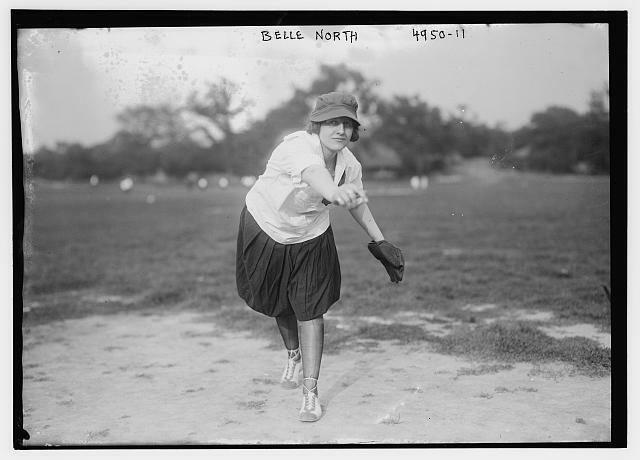 The expression on her face, plus the title of Belle North, female pitcher (baseball) (1919) made me curious. Who is this woman pitching baseballs in 1919 (nice follow through she has)? She could not even vote in 1919! So, Belle North, who were you? Where were you? Public domain image from Library of Congress Bain Collection. As often, in the record for the image, the Library of Congress has all kinds of metadata about the original image and where it is in the collection. “About this item: tells us nothing, but none of them about Belle North. Wikipedia came up blank. The only things the Great Google comes up with are places selling/auctioning prints of the same photo (one just fetched a whopping 7.45 Euros). I tried some searches there but came up with none. So I struck out big time finding anything about Belle North. The internet does that some time. So Broome NY is not “too far” from Cooperstown/Leatherstocking region in NY. Well done! How did you get to Harry Lamount Johnson?